Mondays except 25 March, 29 April and 6 May 2019. Closed on Tuesday, 7 May 2019. Numbers in parentheses indicate discount fees for groups of 20 or more. Admission is free for Special Exhibition or Permanent Collection ticket holders. Visitors aged 18 and under or 65 and older are admitted free of charge. Please show your ID upon entrance to confirm your age. Disabled visitors admitted free of charge, with one attendant. Please present your disability identification upon arrival. Hayashi Tadamasa (1853–1906) was the first Japanese individual to trade in Japanese art in the West. 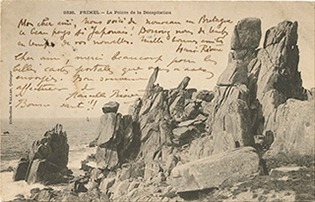 Having learned French in his native country, he attended the 1878 Paris Exposition Universelle, or World’s Fair, as an interpreter. This was a time when Japanese art and crafts were gaining a considerable following abroad. 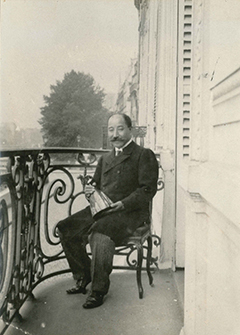 Hayashi decided to stay in Paris after the World’s Fair and eventually started a dealership. The paintings, crafts, and ukiyo-e prints he imported directly from Japan for sale, together with his profound knowledge of the items, were highly appreciated by Western admirers of Japanese art, and proved a driving force in the rise of japonisme. While showing Japanese art and crafts at expositions in various places, and conducting his activities as a dealer, Hayashi became aware of the important cultural role played by art museums in the West. Dreaming of one day building an art museum in Japan, little by little he built up a collection of Western art, mainly works by contemporary artists. Hayashi’s vision for a museum of Western art in his homeland, in fact, preceded by as many as 25 years the similar enterprise of Matsukata Kojiro whose collection would eventualy form the core of our museum. The Hayashi plan, however, came to nothing, due to his early death after returning to Japan. His collection was scattered through a number of sales held before and after his death. 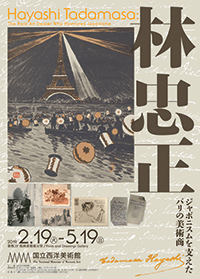 This exhibition, which features works from the collection of Kigi Yasuko, an historical novelist and wife of Hayashi’s grandson, traces the life of Hayashi Tadamasa with special focus on his involvement in expositions and related activities, the friendships he built up through Japanese and Western art and crafts, and the fate of his collection. Hayashi at times has been negatively portrayed as someone who drained away from Japan a large amount of its art and crafts. It would give us great pleasure if this exhibition were to encourage a reevaluation of the activities of a man who devoted his life to cultural exchange between Japan and Europe through art.